In times of need, we often see countries aiding others by dropping needed supplies from airplanes. While it is nowhere near the difficulty of the actual act, Christiaan Rendle’s new game app, Airdrop Pro, allows you simulate a cargo drop. The objective is not as crucial as basic survival, but to land the cargo shipment onto the targets on the ground. 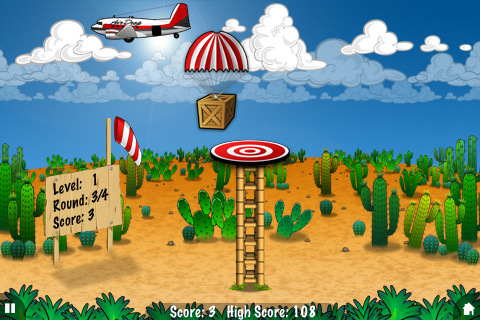 Tap the screen to release the cargo, and tilt the iPhone left or right to help adjust it’s flight down. You must keep track of both the plane’s speed and the direction that the wind is blowing in, or else you will absolutely miss your target. The beginning levels consist of a handful of package drops for one target; each package drop has a different scenario, with changing wind directions, target heights, and plane speeds. As you clear more levels, the targets on-screen multiply and become smaller; be sure to note the parachute color and land on a target with the corresponding shade. If you manage to land all the cargo on-target for a level (a “perfect round”), you gain a life to be used in following rounds. Airdrop Pro is a simple concept with intuitive gameplay and controls: as such, the physics are pretty good at mimicking real-life conditions. If the wind is blowing, your package will drift in that direction. If the plane is going faster, you need to anticipate the momentum that’s going to give your cargo. That being said, it is substantially harder to complete this game than it sounds, especially in the higher levels. Unfortunately, there is no worldwide leaderboard in place as of yet, but the developer promises to include some sort of score-sharing capability in the next update. Another area where Airdop Pro is lacking is in any sort of autosave function: if you lose in any level, you’re right back where you started. It’s extremely frustrating for those who’ve passed quite a few levels already. Furthermore, while the graphics are pretty enough (particularly the different background shots), the soundtrack is non-existent and the sound effects are sparse…this is a pretty good game, but has only just begun to develop. Hopefully further updates will improve upon the bare essentials. AppSafari review of Airdrop Pro was written by Julie Guan on March 31st, 2010 and categorized under App Store, Fun, Games, Mini Games, Physics Based. Page viewed 5604 times, 1 so far today. Need help on using these apps? Please read the Help Page. Great Game! Love the graphics. Fun and challenging. This is really cute and lots of fun. The kids keep bugging me for my phone so they can play. This app is a MUST HAVE!!! Awesome graphics n simply uber amts of fun…Great concept too….